Tag Archive | "Ethan Riley"
At 10-years-old, Ethan Riley, of Pierson, is already a veteran hunter. 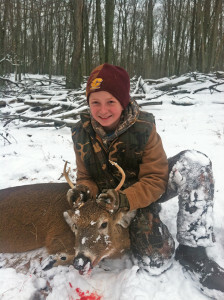 He got a doe last December, during his first hunting season, and then got his first buck, a three-point, on Monday, November 25, while using a .243 Savage. Ethan is the son of Terilynn and Ryan Riley, of Pierson.